BULLARD – As the winter months draw to a close, the action on the golf course is starting to heat up. 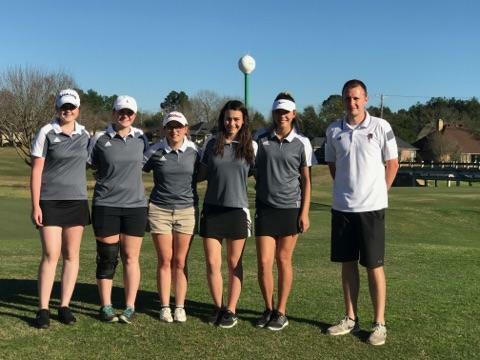 The Grapeland Sandiettes have hit the links already and teed off in their second tournament of the season last Wednesday, Feb. 22 at the Brook Hill Invitational at Emerald Bay. The Sandiettes return four of the five members from last year’s team which placed ninth at the state tournament. Hannah Chipman, Madelyn Conner, Sayler Leblanc and Callie Richburg return to this year’s team along with newcomers Jenna Lawrence and Carly Parker. Lawrence is expected to take the place of Emily Walker who graduated last year after f inishing among the top 10 individual golfers in the state tournament. Lawrence finished 12th at state last year and is looking to help the Sandiettes bring home the gold this year. the Sandiettes. Madelyn Conner had a strong showing as she shot a 109. Carly Parker recorded a 117, Callie Richburg had a 123 and Sayler LeBlanc shot a 125 to round out the Sandiette scoring. As a team, the Sandiettes finished ninth at the tournament with a total score of 435. Hannah Chipman, three shots behind Lawrence at the state tournament, had just finished her basketball season the night before and did not compete at the tournament. 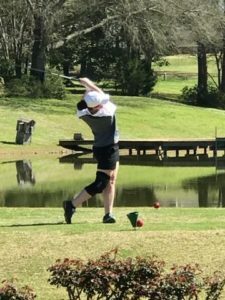 Other individuals competing at the tournament included Latexo Lady Tigers Jordan Davenport who shot a 104 and Kelsey Patterson with a 107. Lovelady Lady Lions Allison Hay and Olivia Wilson were also in Bullard for the competition. Wilson carded a 116 and Hay shot a 121. Palestine Lady Cat Charlee Cockrell shot an impressive 85 while Summer Hagan had a 114 and Stevie Ybarra carded a 115.